GATE is the abbreviation of Graduate Aptitude Test in Engineering. It is a national level of test in India for the budding engineers and science students who want to go for higher studies in engineering or science after the completion of their undergraduate courses in various streams in engineering or science. The examination is conducted by the Indian Institute of Technology (IIT) and Indian Institute of Science (IISc) on behalf of National Coordination Board – GATE. Though these two premium institutes arrange the examination in pan India, the GATE score is accepted almost in every institute, college, and the university as a primary criterion for the admission in the master’s programs in science and engineering. Even some organizations like BHEL, ONGC, IOC, NHPC, etc. also accept GATE score as the primary measurement in their entry level recruitment process for engineering graduates. A good score in GATE is a precondition for the admission in the top graded institutes in this country, at the same time, it is a highly flexible examination that helps a student to change their stream at the master’s level and become an expert in another stream of engineering or science. At present, GATE is conducted on 23 different subjects in engineering and science. It includes all common fields of engineering like Mechanical engineering, Aerospace engineering, Instrumentation engineering, Civil engineering, Chemical engineering, Computer science and Information Technology, Metallurgical engineering, Electronics and Communication Engineering, etc. GATE is also conducted on all common science subjects, like Physics, Chemistry, Mathematics, Ecology and Evolution, Geology and Geophysics, Life Sciences, etc. Read to know more about gate exam 2017. Students pursuing integrated master’s degree and have already completed the 2nd year in these courses can apply for GATE. Students possessing the equivalent qualification of BTech or BE like the students who have passed or at least cleared Section A of AMIE or AMICE can apply for this examination. Students who are pursuing five years’ dual degree program engineering or technology and have already completed the 4th year can also apply for GATE. Students can directly apply for master’s degree course in the prestigious institutes in India like IITs, NITs, and IISc. As GATE score is accepted by several PSUs in India, it provides an opportunity to obtain lucrative jobs in these PSUs. Due to stiff competition, many meritorious students don’t get a scope to study in their dream institutes like the IITs. GATE opens up another chance to achieve their cherished target. Some foreign universities in Singapore and Malaysia also accept GATE score for admission in their MS programs. GATE fulfills a student’s dream to pursue higher studies in management after engineering, as this score is accepted by several prestigious management institutes like the IIM Chennai, NITIE Mumbai, etc. As a whole, GATE is a highly flexible common entrance examination that simultaneously opens up many opportunities to a student. The examination has no age bar, moreover, it doesn’t require a minimum percentage of marks in the last examination, which provides an opportunity to the students to fulfill their dream of higher studies and lucrative career in science or engineering. Also here are the tips to select the best coaching center for GATE coaching. Perhaps, this is the most attractive part of GATE where a student is free to opt any other stream though they have not studied it in the bachelor’s programs. Many students get bored with their current stream of studies. It is often found that students of electrical engineering want to switch to IT or instrumentation engineering. Again, there are some students who find it hard to crack the subject only after getting admission. In all these situations, GATE offers a scope to change the stream and select the other that seems more interesting or rather easy to the students. Is switching to a different stream in engineering universal? Though the students can switch their streams in GATE, whether they will be eligible for the admission in the changed stream in an institute or not is at the sole discretion of the institute. Students need to read the eligibility criteria of the respective institutes only. One premium institute requires a general candidate to have 704 scores in GATE in mechanical engineering for pursuing MTech in automobile engineering. Along with this, they also demand a BTech, BE, or AMIE certificate in mechanical engineering only. That means, this institute will not entertain the students who want to change their streams. A student possessing any of the above-mentioned degrees needs to clear GATE on mechanical engineering to go for the higher study in automobile engineering from this institute. One institute demands at least 710 scores in GATE for pursuing MTech in industrial engineering along with a bachelor’s degree in any one of the following streams: mechanical engineering, production engineering, aerospace engineering, industrial engineering, marine engineering, production engineering, etc. So, a candidate can pursue MTech in industrial engineering with a BE or BTech in any of these streams and if he has got the cutoff marks in GATE on any of the related subjects as mentioned in the eligibility criteria. So, there is a scope for a marine engineering student to study industrial engineering if he appears in GATE in mechanical engineering or engineering science. The eligibility criteria for getting admission in MTech in aerospace engineering in a premium institute in Chennai is found to be as follows: a bachelor’s degree in any branch of engineering with at least 750 GATE score in aerospace, civil, mechanical, or XE (engineering science). Here, the students from any branch of engineering are eligible for MTech in aerospace engineering if he gets the minimum cut off score as mentioned above. In the same institute, a candidate can apply for MTech in civil engineering if the candidate has passed BTech in any stream and GATE in civil engineering only. So, the examples are the clear indication of extreme flexibility that GATE provides to the students. They can fulfill their dream of getting higher degrees in other streams or even pursue management degrees from the prestigious institutes or colleges when they have studied a different subject in undergraduate courses. The admission criteria changes from one institute to another. Even, the seven IITs advertise for fresh admissions separately. So, students need to read the admission criteria of their preferred institutes thoroughly before applying to them. A student is allowed to appear in any one of the 23 subjects on which GATE is taken every year. Read more to know about the changes made in GATE exam for the coming year. Is switching from science to engineering possible? Students in different science backgrounds can pursue MTech in many engineering streams after completing their postgraduate degrees in science. Some premium institutes allow MTech in biotechnology after the completion of master’s degree in science from any stream if the candidate had studied biology at the 10+2 level. Similarly, MTech in electrical and electronics engineering is possible if the candidate has completed MSc in electronics. In both these cases, the candidates have to clear GATE in the subject of specialization they are aspiring to opt in MTech. So, plenty of examples could be placed where the students get a scope to change their subjects at the master’s levels and fulfill their dream of gaining professional knowledge on some other interesting subjects. Even, the science students get the scope to pursue higher studies in engineering and technology. The syllabus for GATE consists of general aptitude test, engineering mathematics, and the subject of specialization. The examination is taken online. In three hours, the students need to complete 65 questions carrying 100 marks in total. Out of these 100 marks, the subject carries 70-75 marks and the rest is distributed between the aptitude test and engineering mathematics. The question paper contains both multiple choice questions and numerical type of questions. It is necessary to understand the questions pattern of previous years on the subject of specialization and take preparation accordingly. It is also necessary to read the syllabus thoroughly before planning a preparation strategy. Here are some of the tips for self-preparation of GATE. GATE is a highly competitive and tough examination. Here the questions are designed by the most experienced professors and industry professionals with an aim to understand a student’s working knowledge on the subject. Aspirants need to possess the highest levels of knowledge on the subjects to crack the examination successfully. So, a thorough preparation is required well ahead of the examination. Experts in this field and past successful candidates advise starting preparing for the examination at least 9-10 months before the examination. They have to start from scratch as they have to compete with the students who have already studied the subject for the last couple years or achieved master’s or bachelor’s degrees on the subject. A thorough study of the whole syllabus including understanding the GATE question paper pattern is necessary to obtain a good result in the examination. Regular mock test with a strict time barrier is also very helpful as in the actual examination time often matters for many candidates. The questions are set in such a way that a student needs to work on them as fast as possible. This would be possible only when a student practices mock test papers every day with a fixed duration. Selection of good books and other study materials are very important for every student, especially for those who want to change their streams. Read more to get last one-month preparation tips for GATE examination. As a whole, it is necessary for a student to understand the level of knowledge required to crack the examination and then compare with the own knowledge on the subject to start preparing accordingly. Obviously, for a new candidate, the gap between the above mentioned two aspects remains wider than the regular candidates. So, they have to study hard to fulfill their dream of completing higher studies in some different streams after clearing the prestigious GATE examination. 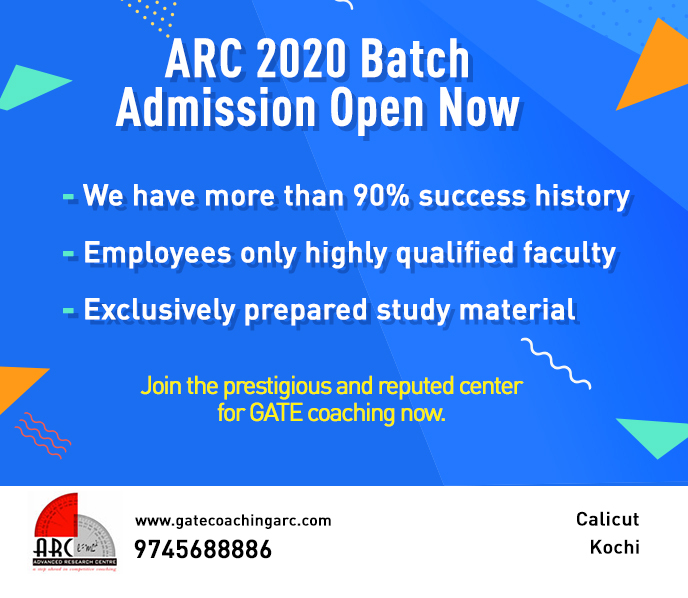 ARC Foundation is the best GATE coaching center in Calicut and also occupies the initial position in providing best tips for last moment preparation. We are always ready to provide any information related to GATE exams. Contact us for more details.